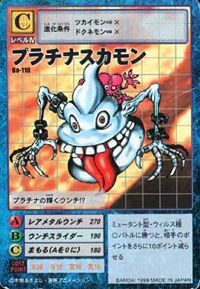 A po*p-shaped Digimon that shines like platinum. It is a species of Scumon that absorbed the data of minor metals, giving it a luxurious appearance, but its abilities are at the same level as Scumon's. It appears to not have powered-up in any significant way. Its Special Move is flinging metallic, shining po*p at the enemy (Rare Metal Unchi). | Platinum is a type of metal. | Suka is a romanization of 「スカ」. Rare Metal Unchi  Rare Metal Poop レアメタルウンチ Rea Metaru Unchi Rare Metal Poop/Metal Bomber Throws a platinum poop. 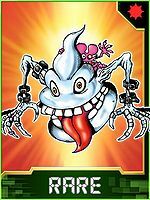 トランスメスマー Toransu Mesumā Panic Wave Uses gas to grant itself or its allies the ability to confuse opponents with their attacks. Unchi Slider  Poop Slider ウンチスライダー Unchi Suraidā Slippery Sludge Throws a normal poop that curves in mid-air. メタリックガード Metarikku Gādo Metalic Guard Covers itself in a barrier then rams the enemy. 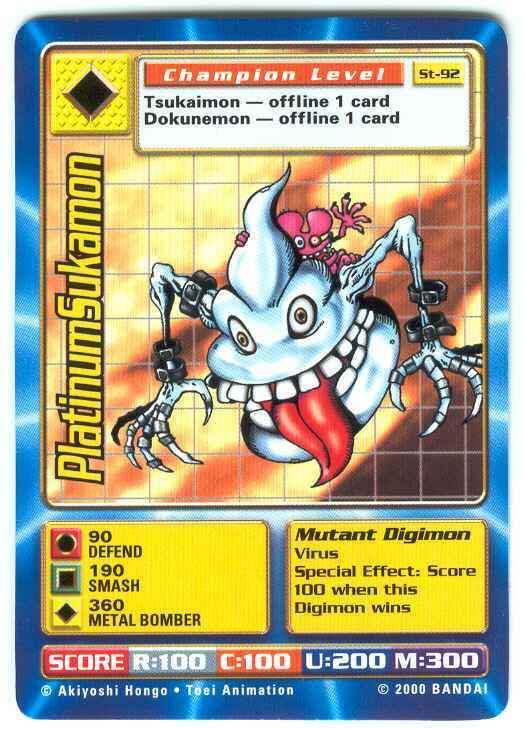 Platinum Scumon is an obtainable Digimon. 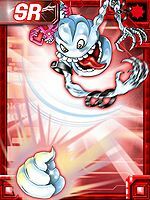 Evolves from Hagurumon (2-3 DP) and can evolve to Vademon (0+ DP). 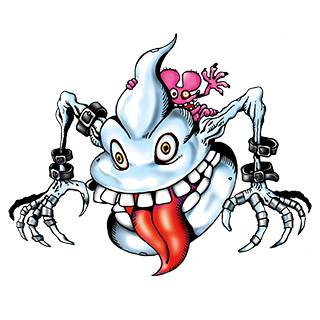 Can be evolved from Pawn Chessmon (Black) if above level 19 and Spirit above 125, or can be found at Sewage Tunnel. He can evolve to Metal Mamemon if above level 34. He also appears as a boss Digimon at Sewage Tunnel. Can be evolved from Kotemon if above level 25 and defense 120, or can be found at Angler Tunnel. Adult and Perfect level Digimon will evolve to Platinum Scumon when the poop gauge is maxed. Adult and Perfect level Digimon will evolve to Platinum Scumon when the poop gauge is maxed. Piemon runs experiments, one of which maxes out the poop gauge. This can even effect Ultimate and Super-Ultimate level Digimon who do not poop, and will cause them to randomly become either Scumon or Platinum Scumon. This page was last modified on 10 January 2019, at 03:18.